The change of seasons is a delicate moment for the body. One must become accustomed to new temperatures and new rhythms that often lead to a lack of energy, difficulty in concentration, listlessness, and a lack of appetite. Autumn is the season in which our glowy summer skin becomes dry and our body rebels. The continuous changes in temperature and humidity put a strain on the natural defenses of the skin. Autumn, being a period of seasonal change, represents a critical moment in caring for damaged skin as the problems related to the intoxication intensify: on one hand, the body tries to eliminate toxins to prepare for the particularly critical winter months to come, on the other hand, the epidermis is attacked from the outside by pollutants, making it more difficult for skin to become adequately hydrated. The glory days of sun, sweat and air conditioning sure were sweet as we rocked to concerts under the stars, but now that autumn has arrived, our bodies are screaming for attention as the variation of climatic conditions and diet wreak havoc on our sensitive skin! The undeniable queen of topical treatments in treating dry, scaly, summer skin is olive oil. Simply substitute your normal cleanser with olive oil. Rub it over the driest areas of your body, and then place a warm, damp cloth on top to enable your skin to absorb the oil. Do not rinse the skin, allow the oil to penetrate deeply and provide much needed skin nourishment. Try making a sweet scrub by combining two tablespoons of olive oil with half a teaspoon of sugar to exfoliate the skin in a delicate way after the summer season. The end of the summer marks an important moment in skin awareness. After hours of sun exposure, it’s time to protect and hydrate skin to maintain elasticity and avoid the dreaded dark spots! Sit back, relax and start with a facial and body scrub that will cleanse your skin and moisturize it at the same time. 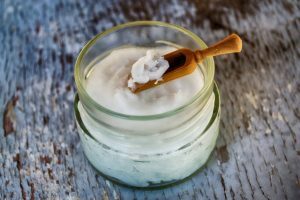 Coconut oil has nourishing and emollient properties. When used daily, it offers many benefits for dry, cracking, inflamed skin, and offers protection for the cold winter months to come. Pour the drops of lemon essential oil in the coconut oil, mix and then add the sugar and salt. Mix until you reach a homogeneous mixture. If necessary, add more sugar or oil until the mixture is properly mixed. It can be stored in a glass jar. Apply the mixture by massaging it on your body using circular movements to promote circulation. After approximately 5 minutes of this relaxing massage, rinse with warm water. You may apply the mixture to your face in the same manner, using delicate pressure as the skin on the face tends to be more sensitive. Remove after 3-5 minutes using a warm cloth.